Aman has a PB 1:42.37 in the 800m. In track and field, a gold medal and a No. 1 world ranking isn’t always enough to earn recognition as the best at what you do. Sometimes, one athlete’s reputation and past accomplishments can overshadow the more recent success of another athlete. That seems to be the case going into the men’s 800-meter race at this year’s IAAF World Championships, where the reigning champion and top-ranked competitor on the planet isn’t even considered the class of his event to many track experts and observers. Mohammed Aman, a 21-year-old Muslim from Ethiopia, will land in Beijing for the worlds (August 22-30) looking to defend the 800-meter gold medal he won at the 2013 World Championships in Moscow. 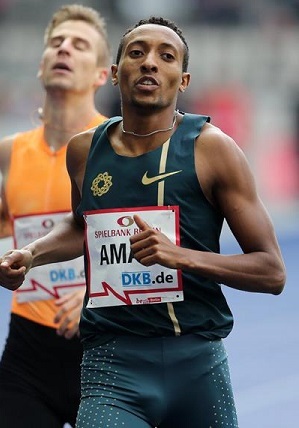 Aman is also the reigning World Indoor Champion at 800 meters, claiming that gold medal in 2014 in Sopot. He is currently No. 1 in the IAAF ranking, having run the fastest time of the year with a 1:43.56 in Rome on June 4. Despite all of that, Aman is not really the favorite going into Beijing. That distinction belongs to David Rudisha, the 26-year-old superstar from Kenya who has the 10th-fastest 800-meter time in the world this year at 1:44.94. Rudisha still trumps Aman as the marquee name in the 800 mainly because of what Rudisha did the last time track had the entire world’s attention. At the 2012 Summer Olympics in London, Rudisha not only crushed the field to win a gold medal, but he also he did it in world-record time — crossing the finish line in 1:40.91 in one of the most memorable moments and dominant performances of the London Games. Aman, who was only 17 when he put himself on the track and field map by beating Rudisha in a 2011 meet in Milan, was also in that Olympic final in 2012. For a stretch he was hanging with Rudisha in second place before fading late in the race and finishing in sixth place. The two rivals did not meet at the 2013 World Championships due to an injury suffered by Rudisha. Aman won gold that time. Since then, he has been a consistently elite performer on the international scene while Rudisha has become the Usain Bolt of the 800, appearing less frequently now that he has the financial flexibility to be more selective with when he runs. In Beijing, Rudisha will be facing Aman while the latter is on top of his game. After a surprising ninth-place finish in the Diamond League season opener in Doha, Aman reeled off back-to-back DL victories in Eugene, Ore., and Rome, both times maintaining his form in a powerful finishing spring to hold off hard-charging challenger Nijel Amos of Botswana.